Nah I didn't grow up, I'm currently going to Tech as a junior.. I know two guys from Lamesa, I've never driven through it but from what I hear it's really tiny. And my Tech stuff... it's only going to grow throughout the year as we get closer to school and my 3rd roommate moves in. Wreck 'em! Nice setup Layd Dly. I think we have the same stand in our main systems. Before i moved all my good gear upstairs, you get the idea. Will Update When i get some pics. LOL, judging from the second Pic, is your new dlp like 5 feet from the couch (futon maybe)? Yep, same stand. It took a long time for me to decide on that one, but the price and mainly the open design won out. Just curious, why did you move to the other room? Seems like the living room area would support more movie watchers. It is! It's the first time I've had a gaming system hooked up to surround sound. Makes the experience so much better. The B&W's blow away the Boston Acoustic setup I had previously. Are you happy with your elemental Designs I thimnk i am going to get them. Very Very happy, i love them best spearkers bar none for the price. And since i moved my good stuff up stairs i plain on buying 3 more A6-5T5's for my fronts and 2 A6-5TC's surrounds for my living room to replace my yamaha satellite's. I also have a eD 12" 13ov2 that i also love. I am a SONY homer. Lol BigNupe - I think I might have to flog the old stuff to help fund the new stuff so sorry mate !! Thanks for the compliment earlier - my DVD & Blu-Ray collection is rather miniscule compared to most other peeps as to be honest I'm a bit of a fussy git where flicks are concerned lol, but I'll post a pic of it anyways maybe ? Alright so today after I got the call from Best Buy about my TV being here tomorrow morning I decided to go ahead and get my new TV stand today. I got it set up and everything, though with my 32" it looks a bit weird because the stand seems to dwarf the TV. Anyways, here's the room as it looks now with the new stand/old TV. [QUOTE="bonehead848, post: 0]gorgeous set up 43. Here are a couple pics of mine. I am building the center as we speak. Surrounds are next. I will get some better pics later. 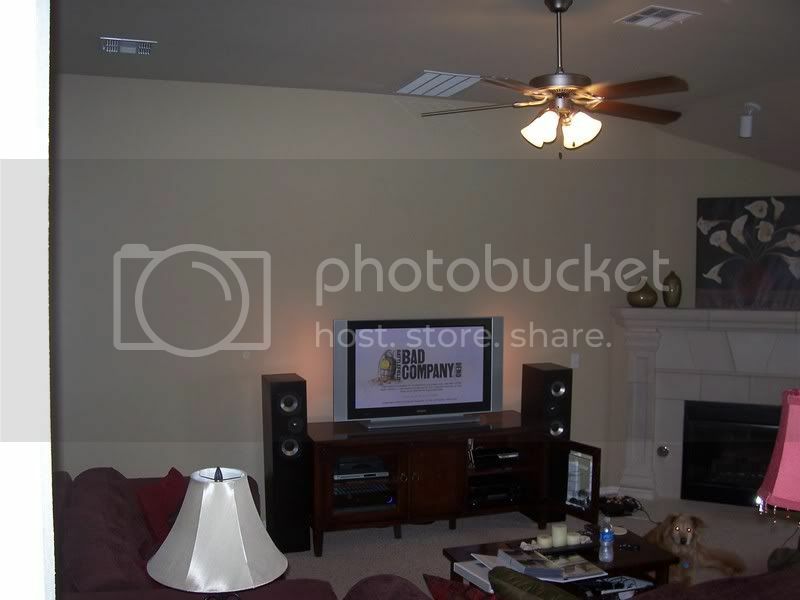 This one is just to show where the sub is located (the grate above the tv). The mains were also built by me. Some of the best speakers I have ever heard. Awesome! I never thought about putting a sub in the attic above the setup! What kind of sub are you using in that setup? I am taking it that it is a car audio sub? I want to say that this thread is the exact opposite of 56k friendly, and using 'reveal' still makes your computer download the pics... you just don't see them till you click. at least delete your pics from the individual posts at the bottom so they are not posted twice, once the OP takes your pics and adds them to the OP. Yes, it's a real bunny. Haa haa, I think we have the same couch/sofa set! You can barely see mine in my photos, but it looks identical to mine! [QUOTE="ttech10, post: 0]Alright so today after I got the call from Best Buy about my TV being here tomorrow morning I decided to go ahead and get my new TV stand today. I see you frequent Chick-fila! Chicken Mini's FTW! Oh yea, it's probably my 2nd favorite fast food place. We only have one here (that's not in a mall) and it's so far away... but good thing it is otherwise I would eat there much more often. [QUOTE="MonkeyClaw®, post: 0]Awesome! I never thought about putting a sub in the attic above the setup! What kind of sub are you using in that setup? I am taking it that it is a car audio sub? It is called an infinite baffle and there are very very few subs that can match in in terms of output and clarity. It is 2 18" fi IB subwoofers. They are made for HT use and are powered by about 1600 watts. 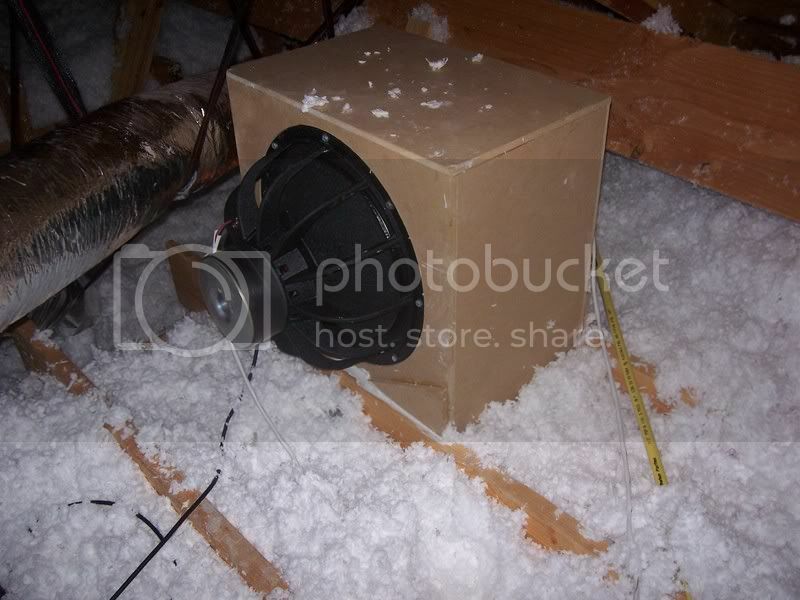 It is essentially a sealed box with my attic being the box. This allows it to get down to like 11Hz but still have a ton of output in higher frequencies. [QUOTE="PhinheadLR, post: 0] and don't hold me accountable for the ABBA CD--it is the wife's. Oi ! Abba are great !! Nice setup Phinhead. Alright, guys, I just got done unboxing my TV and getting it setup. I really like yours since it's nice and clean, can't see any of the wires. i just have to say... BOW TO THE MASTERS! you're all awesome in your setups. esp. THE FORCE's. just stunning. Thanks That was one of the main considerations I had for selecting a TV stand. Since everything is enclosed, it was a little hot, but I was able to mount a few fans inside to blow the hot air out when necessary. Right now I have to flip a switch to get the fans running, but I'd eventually like to have them turn on automatically once the temps hit a certain level. The PC stays surprisingly cool even when it's brute forcing its way through 1080p h.264 videos. you guys have some serious sick systems. Xbox hacked with 250GB HDD. [QUOTE="rykomatsu, post: 0]Thanks That was one of the main considerations I had for selecting a TV stand. Since everything is enclosed, it was a little hot, but I was able to mount a few fans inside to blow the hot air out when necessary. Right now I have to flip a switch to get the fans running, but I'd eventually like to have them turn on automatically once the temps hit a certain level. The PC stays surprisingly cool even when it's brute forcing its way through 1080p h.264 videos. [/quote]I almost bought this stand. I really liked the lights mounted inside (you should get a shot with the lights on). However, I was worried about the heat generated by my receiver and the PS3. It sounds like you found a solution to the problem, though. I had a 32" up until yesterday, so don't feel too bad. [QUOTE="rykomatsu, post: 0]Laurier's sending me an AC adapter for it. I bought the floor model (can't beat $200 out the door for that stand) and it didn't have the adapter so that's why no pics yet [/quote]$200? Wow, that is a good price! Thought I'd post my weak yet still good setup. I do not have the audio setup yet, but I will in the fall. Some of my games, although this is an older pic, I'll update later. I'm too lazy to take a recent one.